All those who were in Weihsien prison camp know that Tipton and Hummel had made an evasion during the month of June 1944, but what they don't know, is how it was prepared and how, finally, it succeeded. I will try to give them that complementary information. For a few young and dynamic prisoners who didn't have family responsibilities, evading camp was a constant dream. I was one of them. It was also a means to lessen the monotony of the camp days. Well, to do so, there were a few conditions to respect. Firstly, absolute secrecy was a major clause. Father de Jaegher, who was one of those young and dynamic elements, and with whom I shared the same room, had the same desire of evasion. We however never spoke about it. Every one of us, without the knowing of the others, was trying to put up a contact with a Chinese from the outside. That was the second condition to accomplish: to find a serious arrangement with a Chinese from the exterior who sometimes came into camp. This service would have to be well paid for, and that would be done by Larry Tipton, often seen with Father de Jaegher and who had a few gold bars, a necessity for the transaction. Tipton and R. de Jaegher were often seen in the mornings, walking to and fro on the sports field pretending to improve their Chinese language while, in fact, they were exercising their muscles for the long walks they would have to make, once outside. That was during the winter period of 1943-44. Meanwhile, R. de Jaegher kept on trying to establish a contact with the cesspool coolies that came daily to empty the prisoners' latrines. As for myself, I was lucky enough to meet and make friends with a Chinese carter bringing the vegetables into camp. I talked about it to R. de Jaegher, and we decided that I could maybe try something about it. As my Chinese friend seemed trustworthy and quite serious, we promised him a good reward by the means of Larry Tipton's gold bars. That was during the months of March-April, 1944. One day, my Chinese contact brought me a written message: "our plan is well established, and on the chosen day, we would be met and provided with donkeys or mules on a road boarded by trees, situated beyond the valley at the North-East end of the camp. We were to have a little flag with the mention: "welcome to our foreign friends". We hoped to travel by night so as to reach a safe enough point by the following day. We had now to select the date. We had observed the moon and decided to choose a night when the moon would rise after midnight, which would ease our moving about. Don't forget that in those days, there was no street lighting. That got us in the whereabouts of the 10th of June. In the meantime, Father de Jaegher had had difficulties with our immediate ecclesiastic superior in camp, Father Rutherford. He had been informed of our project by another Father, (N.W. ), and had pronounced an ecclesiastic sanction in the terms of: "suspensus a divinis" if ever he left the camp. He had to, he said, because it was vital to avoid the eventual reprisals by our Japanese captors towards the Christian prisoners in camp. Tipton was very disappointed. He absolutely wanted to leave the camp with a missionary. You must know, that in those days, local churches easily welcomed the travelling missionaries. Father de Jaegher told me of this interdiction, and it was agreed between us that I would take his place. Alas, whilst sitting on my bed, and while, in great secrecy, I was confectioning my back sac, my colleague, Father N.W. saw me doing so and quickly concluded that I was going to take Father de Jaegher's place in the escapade. He told so to Father Rutherford who called for me and pronounced the same banning as he had to R. de Jaegher. A hasty meeting was held, and we decided that Tipton would ask Hummel to take our place. He immediately accepted which allowed us to keep the schedule previously established for the getaway. Now, we had to choose the place and the exact time such as to involve the smallest amount of people and however succeed in our task. As for the place of the breakthrough, we quickly found complicity at the end of an alley (in the vicinity of n°10) where we hid a ladder, absolutely necessary to go over the boundary wall high of more or less 2.40 metres. In those days, on the other side of the wall, there was just a fence with 6 to 7 barbed wires of which the uppermost was electrified. We believed that the current was put on that wire only after 10 P.M., which was curfew time, and also the moment when a Japanese guard switched off all the lights in our compound for the night. We weren't sure about that and told the escapees to wear rubber-soled shoes and rather put their feet on the big porcelain isolators while climbing over the fence. We had also to make sure that there were no Japanese guards around. On the chosen night, our group of 6 or 7 friends were all in place and watching in the different alleys in order to get the ladder in place, against the wall. The time was then, 9.30 P.M. and in less than 5 minutes, Tipton and Hummel were beyond the wall and over the fence. We were, however, very anxious to avoid any mishaps, and had previously arranged with them for a recuperation procedure if ever they missed the "contact" at the scheduled location. That is why, between 6 and 7 in the morning, the following day, I had to be waiting for them near the boundary limits not very far away from our bloc n°56 at a place, behind the wall that was invisible from the watch towers. I hid myself just behind the morgue ready with a thick strong rope. If ever I heard the cry of the owl, I had to thrust the rope over the wall to help them back into the compound. You can easily understand that on that particular night, we didn't sleep very much and that I sighed with relief after 7 o'clock in the morning when I got out of my hiding place just behind the morgue. Now, we had to give the best possible chances to our two escapees in order to let them get away as far as possible from the camp. As we know, the Japs made a roll call every morning at 8 o'clock. At that precise moment we all had to stand in a row in front of our respective blocks and in the order of our badge-numbers. Tipton lived with us, on the first floor. Actually, it was Mc. Laren who was responsible for us towards the Japanese Commandant. I secretly informed Mc Laren of our projects and arranged with him that as warden of our bloc, I would give the alert as late as possible. At the roll call, I would simply say that Tipton was already working in the kitchen. It is only around 10 o'clock that morning, that I mentioned Tipton's absence to Mc Laren. He then asked me, in the presence of the camp's Commandant, to go and make sure that he was not in the toilets or anywhere else. The same thing happened for the missing of Hummel. While I was going all over camp to search for Tipton, the rumour spread fast, and at about 11, I came back empty-handed, and informed the irritated Commandant. He was very sure of himself and absolutely certain to recapture the escapees. As a precautionary measure, he put all the escapees' roommates under room arrest. Even, days after that, and from time to time, they had us rounded up in the middle of the night and guarded by armed Japs. As for the escapees, they rapidly managed to reach the Chinese guerrilla forces and shared their lives with them for 14 months. They managed to smuggle a radio, in small parts, as well as medicines for the hospital and supplements of flour. It is only the day after the parachutes came with the Americans that we saw, one morning, our two escapees all tanned by the sun and in excellent health. Thank you, thank you, thank you, Father Hanquet, for your fascinating story of Tipton and Hummel's escape from Weihsien. Remember how the Japanese counted and counted and counted us over and over again at roll call when they discovered that two men had escaped? The escape prompted the Japanese to move the men out of the hospital and move Chefoo School children in. Children were less likely to be spying or signalling to Chinese over the wall near the hospital. 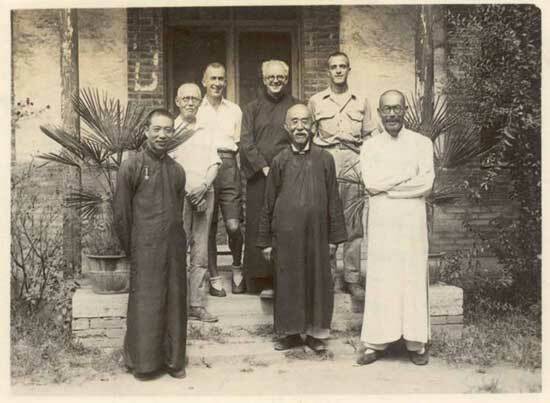 I do hope you will keep telling the Weihsien stories from the perspective of a group up in the camp. Our teachers shielded us children from many realities of the camp. On another subject -- Xun LIU, who identifies him or herself as a post doctoral fellow at Harvard, has contacted me for information about Weihsien. Xun LIU writes, "I am a cultural historian of modern China and am currently a consultant on an oral history project on the Weixian survivors with Dr. Pedro Loureiro, an oral history expert and the chief archivist at the Pacific Basic Institute at Pomona Colege in Los Angeles, California." I will suggest his contacting Natasha about signing onto our bulletin board. Tipton lived just behind us in block 52, and my Mother, with others used to have lessons in Chinese from him. When Tipton went over the wall, my Mother disconsolate..... who is to give her Chinese lessons now ? Everybody reacts in different ways. We were in block 53, and had our place during roll call in front of our block. My father was the Jap translator for our section, and walked with the guard so that he could explain anything in Japanese. The morning after the escape of Tipton and Hummel, I was very anxious to see what would happen as the guard and my Father got to the spot where Tipton should have been.....a lot of hand waving went on, yells and the stamping of feet, then my Father started miming the "going over the wall" signs. We all laughed at that which made the guard absolutely red with rage, I thought that something terrible would happen to my Father. The guard then just spun around and rushed off with as much dignity as he could muster, leaving Father standing there and not knowing just what to do. We waited a very long time after that, and eventually everything was sorted out. It's amazing how much does come back if you really try.